The bottom, right-hand part of the site is massive sandstone, overlain by cross bedded sandstone. 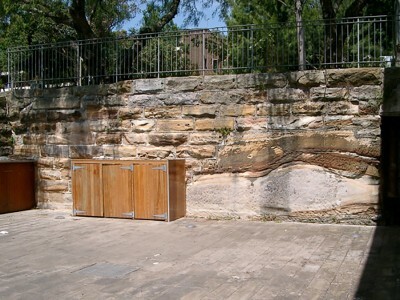 Part of this site is obscured by a rubbish bin enclosure but the important characteristics are clearly visible. The bottom right-hand part of the site shows four phases of deposition – grey laminated sandstone at the bottom, overlain by pale grey massive sandstone, brown laminated sandstone and beige cross bedded sandstone. These phases represent different flow velocities of the river carrying and depositing the sedimentary material. 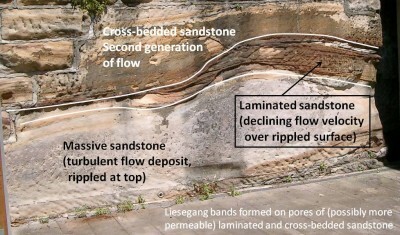 The post-depositional features present are a facing of iron oxide (probably a joint infilling) on the cross bedded sandstone and Liesegang banding in the laminated sandstone. 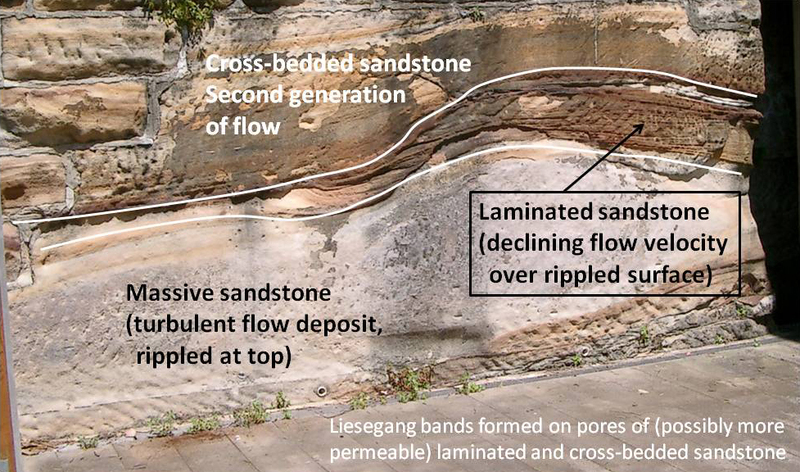 The hewn blocks of sandstone in the left-hand part of the site also show Liesegang bands. The chemistry of Liesegang banding is complex and, as a generalisation, involves the formation of concentric rings or parallel bands of precipitate following the diffusion, one into the other, of two dissolved substances that react to form a less soluble precipitate. In rocks the process is controlled by permeability and, hence, is not necessarily related to bedding. Proceed around the foreshore, past Bellevue, noting the use of disparate materials in the construction of the foreshore walk. Consider the question: Are these materials in sympathy with the local sandstone of the seawall?